Discussion in 'Off-Topic Discussion' started by coreyredken, Mar 10, 2008. Since we all have Toyota Tacoma's and/or thinking about getting one on this site... I have a question to ask!?!? 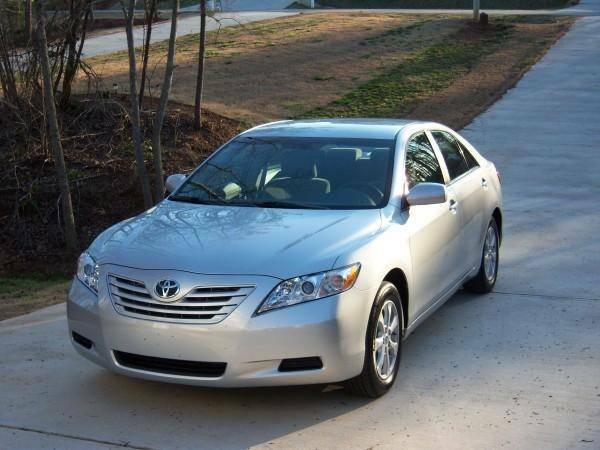 Does anyone on this site have a 07-09 Camry........ and what are your thoughts on the car? I'm thinking about adding one to the garage... but want some opinions? Consumer reports didn't like the new v6 camry. I got a 4 cyl rental and it seemed to be pretty decent, but it was no Tacoma! I had a 4cyl rental, it seemed decent. I do like the body style......it commands attention.......mine anyway. i also had a 4 banger for a rental. it was a nice car, inside and out, and it was also pretty damn quick for a 4cyl too.the gauges and stereo face look cool as hell to!! i think after you test drive one, you will like it. the only thing i would have to get used to is the throttle tip in, especially in a parking lot, but other than that, it was cool. I was able to leave some tire behind with the rental I had. The shifter took some getting used to. My girlfriend drives an 04 XLE. Damn nice car. I looked at the newer ones when I bought my truck. They look awsome. I have heard that they have some transmission problems, read it somewhere. Not sure if it was specific to a particular engine or not. i have had two seperate ones from toyota while my truck has been in the shop. i think something was wrong with the first one, but the second one felt much more responsive. both were the 4cyl autos. i was fairly impressed. it wasn't great but at the same time it wasnt bad either. just go test drive a couple and see what you think. What didn't they like about them ? i bought a new 09 Camry LE today! ! ! Woohoo.. LOVE IT! So excited.. but not half as much fun to drive as my Tacoma! but oh well..
well hell yeah......cause we gotta see it man !!! awesome camry man!! still lovin that silver i see !! !